"Eyes down for a full house!" with a switch controlled Northern comic bingo caller. Run a game of Bingo using accessibility switches. Press your play/pause switch (left hand side) and the Bingo Caller reads out genuinely random numbers while players dab them off their cards. 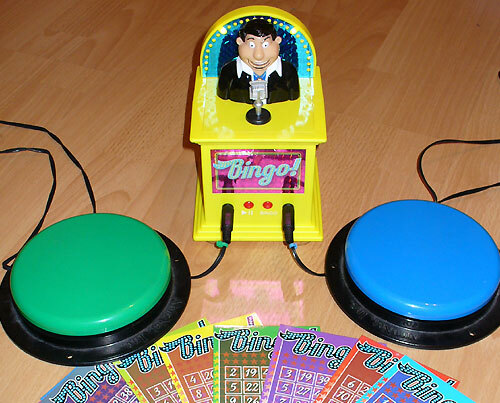 As soon as one player has a full house, press the "Bingo" switch (right hand side) and your personal Bingo Caller reads back the numbers. Includes reusable dry-wipe Bingo cards and marker pens. Activate using the built-in red switches or plug-in accessibility switches. Join in with a game of Bingo even if you don't know your numbers. Click here for a switch accessible Bingo computer. YouTube Video of an undapted version. Large accessibility switches are not included.